I had drafted out the Doggy Pleated Wool Coat Pattern (For Small Dogs) a couple of years ago. I made the coat for my first dog, Mikki. I came across the pattern as I was going through my backup files. The patterns are self-explanatory; You can download the patterns & instructions below. As far as the pleat at the back of the coat, you have a choice of making one inverted pleat or you can make multiple pleats and spread it across the back yoke seam to create a dress like coat. 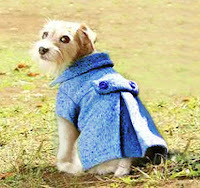 There are endless possibilities of what kind of coat you can create for your dog. You can even make this coat into a dress for your pooch. If you are making only one inverted pleat, make sure your pleat is center at center back. In addition to changing the pleats you can change the collar to any one of these collars, Peter Pan, Sailor, Notches, or Shawl. In my patterns, I have only created an All-in-One Shirt Collar. Like I said this is a base Doggy Pleated Wool Coat Pattern, I didn’t create any trim patterns for download. I assume you guys would like to add different trims to this coat to make it unique and different from others who are downloading this pattern from my blog. Like I have said in my other Dog Clothes Pattern post, I have made the pattern based on my dog’s size; you will have to do some minor adjustments on the pattern to make it fit your pooch. Please feel free to let me know if you have any questions, comments or need me to post smaller or bigger size patterns. Note: Placket Pattern is extra, this will allow you to either do a separate placket or a bend back. If you are using the extra placket pattern, make sure you adjust the collar accordingly. Patterns are for personal use only, not for commercial use. I do, however, appreciate crediting my blog or linking back to the base pattern. You are not able to re-sell the original pattern. Patterns maintain copyright restrictions. You are not allowed to create products from these patterns for commercial use. Patterns on this blog are not intended for re-sell. Any attempt to re-sell patterns from this blog is subject to legal action.